I absolutely love the name of these cupcakes. Death doesn’t appeal to me much but if you gotta go, why not by chocolate! 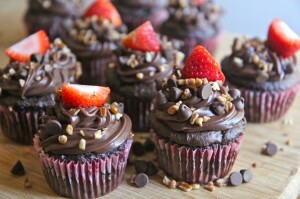 If you are a chocolate lover then you will love these cupcakes. They are full of so many flavors of chocolate that are all balanced out so perfectly! Just look at those chocolate valleys of death! I l love how these bake up. I can’t tell you how many death by chocolate cakes & cupcakes I’ve had that are just waaay to much chocolate (yes that is totally possible). Too much of a good thing isn’t always great especially when it means you can only eat a tiny bite because it’s so sweet. Death By Chocolate Cupcakes- For the true chocolate lover! 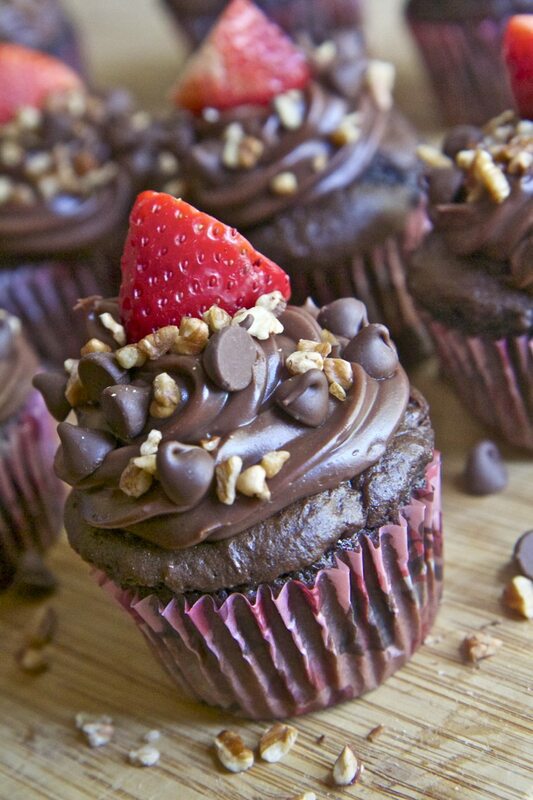 These death by chocolate cupcakes are heaven!! The batter uses a dark chocolate cake mix, chocolate fudge pudding, and semi-sweet chocolate chunks to pack a huge chocolatey bang! All that chocolate is balanced out by adding in sour cream and prepared coffee. Don’t let the box cake scare you away. I’m normally a homemade chocolate cake girl 100% but in this recipe I have to give the dark chocolate box cake it’s props. It taste so divine and is so fluffy and moist. 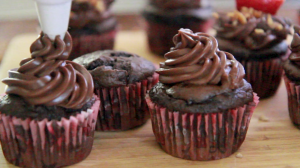 The silky milk chocolate sour cream frosting is my fav!! The texture is like a cross between a pudding and a frosting! It goes perfect with these death by chocolate cupcakes. A buttercream frosting would have been a bit much. My husband is a huge chocolate fan (which is one of the many reasons he married me! Ha! I couldn’t resist) and he took one bite of these and said “yes…please feel free to make these as often as you’d like”. The chocolate chunks in the inside stay so creamy and it’s a welcomed surprise when you bite into them. Store these in the fridge since the frosting has sour cream. If you want to serve these room tempt. just let them sit out. The frosting will remain firm once it been refrigerated. It’s love baby! Make them. 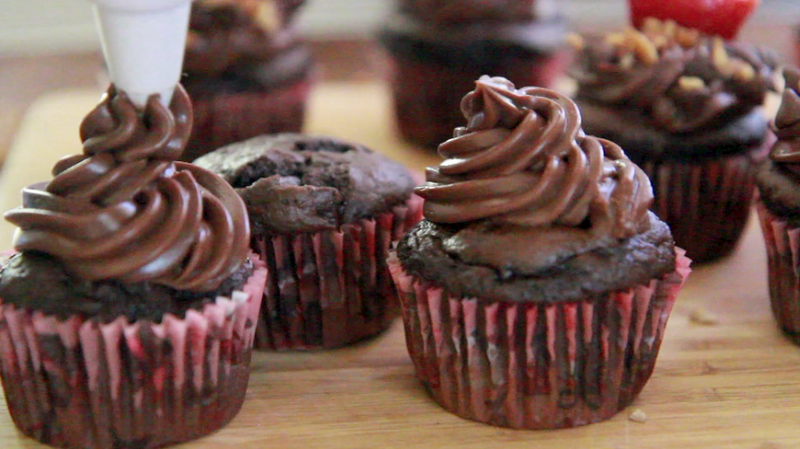 Watch me make these death by chocolate cupcakes from start to finish! In a large bowl, whisk together cake mix and pudding mix until combined. Add in the sour cream, vegetable oil, eggs, and prepared coffee. Mix for 5 minutes or until completely combined. The batter will be thick! I finished off by stirring with a rubber spatula. 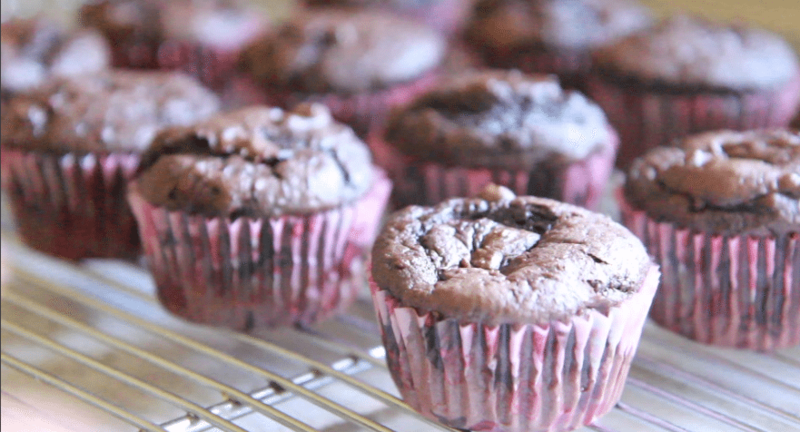 Fill cupcake liners ⅓ full with batter. Remove cupcakes from pan as soon as they come out of the oven. Let cool on a cooling rack while you make the frosting. In a large bowl melt the milk chocolate candy bars in the microwave, stirring every 8-10 seconds until completely melted. The dove chocolate squares took 1 minutes and 30 seconds. Let cool until slightly warm. Refrigerate for 30 seconds or until it's firm enough to hold peaks. When cupcakes are cooled, pipe on the frosting. Using a variety of chocolate works best! Feel free to garnish as you'd like! I am an ABSOLUTE chocolate lover and these look yumazing!! Need to try these asap. Girl, these cupcakes made me slap my Mother (laughing). Like really these came from a box? I am the talk of the town but I can’t take the credit I did all the work that YOU posted I could not have done it without you. Keep those delicious recipes coming I don’t post often but I am following you.